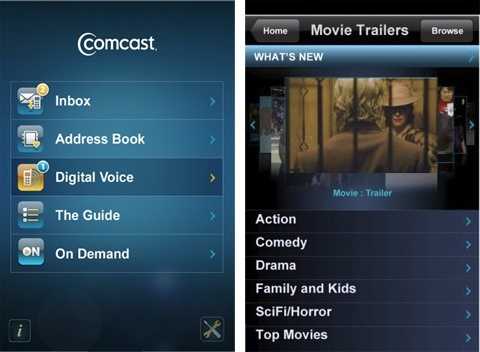 The mobile user experience for members of the Comcast family is about to improve. According to a Mobile Marketing Watch article this week, the cable, internet and digital voice provider giant has announced a new iPhone application that brings that brings convergence managament to your mobile device. The free app includes access to Comcast.net email, visual voice mail, address book sync, and a host of entertainment options. Features include the ability to check Comcast email and listen to home voice mail in one combined inbox, forward home phone calls to the iPhone from the iPhone, view call history and manage home phone settings, see what’s on TV tonight, tomorrow or next week, including program details as well as the ability to watch video-on-demand movie trailers. Personally, I like how users have the ability to forward home calls to the iPhone where they can be better organized and managed. Actually, a lot of the initial information about this app centers on the “organization” aspect. However, I think what will make this app popular is the creativity users have while personalizing Comcast’s many services. Of course, being free and tapping into Comcast’s already huge customer base (24.1 million cable, 15.3 million high-speed Internet and 6.8 million digital voice) won’t hurt either. I’d like to see some additional features such as the ability to bookmark film trailers from television. Let’s say you see a trailer for the new Harry Potter film but you’re not able to catch it in the theater. You could program the movie into a future on-demand queue with a “now available” alert. I would also love the ability to use a mobile device to program my DVR or set a reminder about a certain program to popup on the TV. The ability to watch content from the Comcast DVR on your phone would be very cool as well. The Comcast Corporation website states: “We want to continue to provide people with the communications products and services that connect them to what’s important in their lives.” It’s mobile apps like these that could be differentiators in triple-play competition.